Almost a year ago, when I’d just started my Course, I wrote an early post on the 2010 Prize. I was just beginning to really look at photographs and the book of the Exhibition really caught my eye. At the time, I initially thought that the 2010 winner ‘Huntress with Buck’ was a ‘cruel’ picture in its depiction of a beautiful 14 year old who had been taken to South Africa by her parents so that she could kill her first African animal. My visceral response to this meant that it took some time before I could appreciate the colour, rich tones and composition and compare this with ancient depictions of Celtic goddesses/queens. I never did get to see that particular Exhibition, but last month (6th December 2011) I went to see the 2011 Prize at the National Portrait Gallery which finishes on the 12th February. It was a busy day, and the gallery seemed cramped and photographs small when I compared them with some of the other Exhibitions I had visited during the year (I’m thinking here particularly of the Thomas Struth Exhibition at the Whitechapel Gallery and the Deutsche Bourse Photography Prize contenders at the Photographers’ Gallery Ambika P3, the University of Westminster). The first prize is Harriet and Gentleman Jack, by Jooney Woodward. It’s what I would call a ‘beautiful’ image. A young 13 year old girl with long, flowing titian hair who is cradling her guinea pig, a pink eyed golden cavey, whose fur just about matches Harriet’s hair (although a deeper tone). Could it be called ‘sentimental’ well, maybe it could. It’s certainly the antithesis of last year’s winner. Two girls, a year apart in age – one who kills some animals for pleasure and the other who proudly cradles her pet. They both have similar colouring and gaze confidently at the camera. I wonder what would happen if they both met. What might they have in common? On a technical note, Jooney Woodward used a Mamiya RZ medium format film camera on a tripod, using natural light, whilst David Chancellor used a Mamiya 711 6×7. I can’t say more than that because I’ve never used a Mamiya or a larger format camera but I’m hoping to have the opportunity in the future. There’s something so soft yet clear about the images, with such rich colours. Apparently, this portrait inspired Woodward to continue photographing the ‘quirky’ world of guinea pig enthusiasts . The 2011 second prize went to Jill Wooster for her portrait of her friend, Of Lili. this is a different, more gritty, image which is taken from an ongoing series by Wooster on middle-aged women at difficult stages in their lives. Of Lili was taken with a DSLR with minimal retouching. Another portrait which caught my eye was Erika E, born in 1910 by Karsten Thomaehlen. She must have been beautiful when young and is still beautiful now – her wrinkles only enhance her bone structure.This is from a series, ‘Happy at one hundred’, taken of more than 40 men and women over the age of 100. I can only hope that, if I live that long, I will still have the inner strength and certainty to look the camera straight in the eye and state, “This is me!”. I’m realizing now that these four females, whose ages range from 13 to 100, all have that same direct and confident gaze and this is what has drawn me towards them. I could write more on the portraits exhibited but I think I’ll leave it at this. The Exhibition is still on and the accompanying book presents the images faithfully. When I got back home after my visit I read an email newsletter on, “The return of photo-realism”, by Robert Genn who is a painter. He was commenting on a letter from a reader that bemoaned the fact that painted portraits can now almost be indistinguishable from photographs. Genn’s response was that “tight rendering is easier to do than realistic painting done freshly and expressively”. He also reminded us that many portrait painters do also use photographs – as painters may in general I think, (cf George Shaw) plus, of course, painters also used to use the camera obscura and the camera lucida. Genn also referred to an Exhibition at the Van Gogh Museum, Amsterdam, “Snapshot – Painters & Photography 1888-1915”. I couldn’t go to Amsterdam (and the Exhibition ended on 8th January) but there was an accompanying large and heavy book which I bought from Amazon. It’s fascinating to read. The book investigates seven Post-Impressionist painters and printmakers who also made many personal snapshots which were kept private. They are Pierre Bonnard, Maurice Denis, Felix Vallotton and Edouard Vuillard (members of the Nabis group, Paris) and also George Hendrik Breitner, Henri Evenepoel and Henri Riviere who were working in Europe around the same time. The Introduction by Easton explains that all seven ‘displayed common approaches and interests. They were all enthusiastic about photography and the photographs were meant to be private records, ‘without artistic pretense or commercial aspirations’. She points out that the camera did not supplant the sketch but added a different dimension to visual material that could be drawn upon, and were sometimes taken deliberately as study material for paintings. The three following essays discuss ‘George Eastman and the Handheld Camera’, ‘The New truths of the Snapshot”, and ‘Amateur Photography in the Late Nineteenth Century’. From there, the book looks at the seven artists and their photographs. It really is an interesting book with many photographs and you can see how some of them were translated into actual paintings – many of them being portraits (to bring me back to the beginning of this post). I know that I’ve viewed this Exhibition in terms of what appealed to me the most out of some excellent images. So then I had to ask myself what else was there in the images that made them ‘good’. And, furthermore, what makes a good portrait in general in this modern age? John Berger has commented that in the past, portraits in oil were often used to represent the subject’s social status – therefore they were painted in a context which emphasized this. Renaissance portraits also used symbolism in portraits to represent the subject’s learning, wisdom, explorations and, by means of memento mori, the fact that we all die! However, Graham Clarke (1997) writes, “From the inception of the portrait photograph photographers have been concerned to express in the single image an assumed ‘inner’ being. (p. 101). He goes on to state that the portrait photograph is, “…the site of a complex series of interactions – aesthetic, cultural, ideological, sociological and psychological” (p. 102) which rather contradicts this. The meaning and purpose of portraiture is a complex subject and so here I want to focus upon how do I read a portrait and what makes it good. When I go back to the Taylor Wessing Photographic Portrait Prize, I am reminded that the best 60 portraits (out of over 6,000 entries) were chosen by a judging panel who then agreed the 5 prize winners. The panel were not told the identity of the photographers – although one might guess that some were recognized, (Bibi Aisha, by Jodi Bieber for example). The judges saw prints right from the beginning. Sandy Nairne, Director of the national Portrait Gallery, writes in the Director’s Foreword of the accompanying book, “Only from prints can the richness and subtlety of the very best portraits be appreciated to the full” (p. 2, 2011). I’m going to assume as well that as the photographers were anonymous the members of the judging panel didn’t know the story behind each image, or that some were part of a series – information which can add further depth. What was it that made those 5 winners stand out from the 60 best? I’ve already commented on the richness and colour of Harriet and Gentleman Jack and Woodward has said that she was most struck by the visual potential in the similarities of colouring. You can see how the soft flow of Harriet’s hair is mirrored in the silky softness of the guinea pig’s fur. There are a few small details such as the label on the guinea pig’s ear, Harriet’s nail varnish; the scratch on her hand and the safety pin near her lapel. The girl and guinea pig stand out against the hazy background. Of Lili is very different. Jill Wooster specializes in creating fashion portraits, “that she characterizes as ‘over the top and slightly surreal’” (p. 9, 2011). However she describes her personal work, such as this portrait, as, “….more about an attempt to get under the skin of something” (ibid). She wanted to see if she could capture the balance between Lili’s confidence and vulnerability – the gentle persona with anger just beneath the surface. Wooster states that isn’t sure she succeeded but did get something else, which is Lili’s strength. Is this what came through to the judges? There is her sinewy body in heavily belted jeans and sleeveless tops which show of her slight musculature and whipcord arms. In softer opposition to this Lili has a lacey embellishment on her singlet, is wearing lipstick and her hair is softly arranged. I can see a hint of tension in her stance; her shoulders are slightly raised towards her ears and her face looks slightly frozen. There is a vulnerability about her bare neck. Of course, there are question I want to ask. Does Lili normally wear clothes like that? Does she usually wear lipstick, etc or has this portrait been stage-managed to fit the theme? There is also a greyness about the background/processing which seems to reinforce the tension. With Erika E, born in 1910, (which didn’t win one of the 5 prizes) there are the small clues such as her collar brooch and rings. The softness of her top matches the colour and softness of her hair. I can’t see any obvious attempt to fade her wrinkles. There is an air of confidence and clarity which shines through. Maybe this is too ‘ordinary’ a portrait to win an actual prize. I don’t know anything about her other than her age at the time the portrait was taken. Is she still alive? I hope so. Did/does she have a clear mind – I hope so. Is this part of a ‘good’ portrait as well – the viewer wanting to know more and asking questions about the subject? I seem to have been asking quite a few questions here which is good because it means I’ve opened my eyes more. 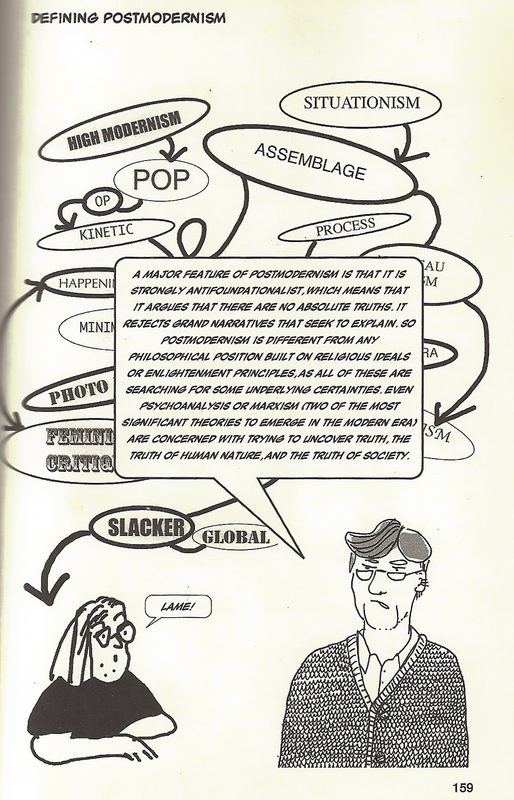 Clarke, G, The Photograph, 1997, Oxford University press, Oxford. Easton, E.W. (ed), Snapshot. Painters and Photography 1888-1915, Yale University Press, New Haven and London. Postmodernism : ‘Style and Subversion 1970-90’ and ‘Signs of a Struggle – Photography in the wake of Postmodernism. I know it’s not considered academic due to lack of scholastic verification but Wikipedia seems a good place to start, because this is where I first looked after hearing the term Postmodernism. Also, Wikipeia is, of course, a product of the era itself. To me this seemed too all-encompassing to fit with my notions of theories and models which can be put to the test so that you can say “This is, or isn’t true”. My other problem is that, in becoming an adult within this period, I’ve probably absorbed its influences and accepted them without realising where they came from and why. I’ve also learned from history studies that periods of change evolve slowly rather than in the steps so clearly defined by historians. If I continue with the latter view then out of a gradual period of change there came sufficient number of intellectuals to agree and state that Modernism had now become Postmodernism. Except of course that all the other “ism’s” were still there. It does conclude that everything we started off associating with art has been thrown into question in the Postmodern world and that Art is a form of visual curiosity which means that , “it is always in some sense about how we view ourselves and others in the world” (p.186) What I discovered for myself by visiting the Exhibition was that the concept has to be experienced rather than understood and described in a logical fashion – at least for now. The visit was some time ago (it’s now 17th January 2012) and I really must now write down my reactions. The major problem was that I haven’t been able to work out what I thought about it. I’m hoping that putting my fingers to the keys now will bring me to some kind of conclusion. As ever it was good to meet with other students (not only from Photography) and also to meet more of the tutors from the other disciplines. The morning was spent going round the main Exhibition and in the afternoon I went to the smaller, separate photography exhibition. The two events being punctuated by a pigeon – surreal, but fitting to the day. Here is the V&A’s own general article. The multi dimensional aspect was very much in keeping with the theme. 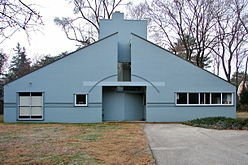 Post-modernism is more generally associated with its roots in architecture but it seems to have been quickly taken up by other creative arts. Architecture appeared early in the Exhibition. I was struck by the work of Venturi and Scott Brown. There was a model of a house which Robert Venturi built for his mother in the early 60s. As I walked around the Exhibition what was coming over to me was that sense of almost childlikeness in terms of “I can do or make anything, with whatever materials, in any shape or form I choose” a freeing of restrictions of cultural and artistic conventions. Historicism recreated methods from the past, inventing new creative renditions and designers also salvaged distressed materials. Working through the Exhibition layout, as the later years came I recognized many of the designs of pottery and furniture I looked at in the magazines then or upmarket shops. Of course, I couldn’t afford to buy them! The clothes too of course, particularly as worn by pop stars of the 1980s such as Annie Lennox, Boy George etc. Vivienne Westwood springs to mind in designer terms. These are clothes more likely to have been seen in magazine and major cities but not in the suburbs from what I remember. There was the music – some of which I enjoyed such as the rather robotic melodies of Kraftwerke’s “Shop Window Dummies”. – we are all just forms to be clothed. Postmodernism had metamorphed into something else – almost an emptiness and recognition that that wonderful bright new post-war future which had once been envisaged had turned out not to be so bright after all. Ridley Scott’s ‘Blade Runner’ (1982) conveyed this sense of a post-apocalyptic world – drab colours, with robots performing human functions. Something that the old style refuse tips always used to remind me of before they become sanitized, segmented and orderly with everything labeled and in its right place. I felt depressed and jangled as I walked out of the Exhibition and decided that a walk around the shop would do me good. I bought two books. “Introducing Post-modern-ism : A graphic guide”, is all black and white, apart from the cover, and in cartoon style. If you think of sound-bites then this book is a visual version. The book which accompanies the Exhibition itself is much broader and academic in approach. “Postmodernism Style and Subversion 1970-1990”. The latter book brings together the thoughts of a group of historians, theorists and critics who assess the impact of postmodernism on all areas of art and design. It’s good to see from the inside of the front cover that, “The radical ideas associated with postmodernism……have always resisted straightforward evaluation” which probably explains why I have had such difficulty getting a grasp of it. The book is beautifully presented and full of information and photographs although, oddly enough, photography as such doesn’t merit much mention as an art form. After a brief lunch I decided to visit the much smaller Photography Exhibition. There were three images which particularly struck me. This met me as I walked in. A photograph of still-life arrangement – a vase of sunflowers; a painting of it, and a handwritten, childlike get well card. It is bright, eye-catching and a visual play on words and pictures. David Hockney did the get-well painting in 1995 for Jonathan Silver, his friend and collaborator (creator of the Salt Mills Gallery, Bradford). The photograph is printed on watercolour paper and obviously references Van Gogh. A reworking of Constable’s painting. This is a photomontage lithograph created by Kennard in 1980 in protest against the siting of American cruise missiles in Britain. Part of a series . This particular one is not on his website but it is reminiscent of a postcard, depicting picturesque scenery disrupted by a caravan and a rusty ship. There was a self-portrait of Cindy Sherman a constructed tableau by Jeff Wall. I recognized one of Karen Knorr’s images (see an earlier post) “The work of Art in the Age of Mechanical Reproduction. Helen Chadwick’s “One Flesh” 1985 assembled from photocopies and an evocation of Mother & Child Renaissance imagery. However, the child is fairly obviously female and a golden placenta provides a ‘visceral depiction of the physical bond”. I could recognize the similar paths being followed in terms of recreating from the past, making use of ‘found/recovered’ photographs; painting directly onto objects which are then photographed (Calum Colvin, ‘Utitled 3”). To me there was a sense of liveliness about most of the images which was missing for me in the larger Exhibition. I still don’t feel as if I have got to grips with Postmodernism. I think I started off wrongly somehow in thinking that it was a philosophical stance regarding Art. It might have been to begin with but now it just seems to be one more collection of stylistic devices alongside all the ones which went before. It borrows, renews, pastiches, turns the old styles on their heads. It’s just the way things are at the moment in the age we’re in. I think we need a new name for it now – Prevision or something like that. I’m now coming towards the end of this Module and, it’s odd, but I don’t want it to finish. Maybe authors feel like this when they’ve written a book (or experienced photographers when they’re coming to the end of a lengthy project). This is not to mention the fact that, as usual, I feel anxious as to whether I’ll be able to meet the brief for the Assignment, especially as I’ve now had the invitation (and a reminder) to apply for formal assessment. Still, best not to think too far ahead and I have a few ideas to explore. This is the first Project. I’ve read through the Handbook notes and this is what immediately comes to mind. I’ll add additional thoughts as I progress through the exercises. Using photography to tell a story now as opposed to treating it as a set of skills. This brings intent more into the frame. What is the purpose of the photograph; how is it going to be used. Michael Freeman (2007 p. 134) writes about the differences between reactive (I like his description of guerrilla still-life photography taken handheld from real life’!) or planned photography, and the role of the photographer’s personality. With regard to the latter, he might well have added experience and self-confidence. My preference is for a mix of reactive and planned – like the action learning cycle, so that a project can attain more depth and immediacy. Subject versus design/form versus content – put the subject first; consider what is important and let this suggest the treatment. Compositional skills may be less important than telling the story; bringing a subject to life. I’m thinking here of the growth in the use of camera phones as snapshots of events. They can bring that raw element of ‘here and now’ action to the fore, the recent riots in London for example (back to guerrilla photography). Images from a royal wedding are received best when beautifully, nay romantically, composed, whereas images of a famous star with her head in curlers and no make-up usually have that ‘snatched out of the blue’ air. Narrative in photography is a way of telling a story through a set of pictures as opposed to trying to tell a story in a single picture. Sometimes, though, just one image conveys a moment in time which encapsulates an issue, as in photojournalism. That single image becomes more than the sum of its parts. For instance, when I see those photographs of coffins of servicemen and women being brought back to the UK I have a flash of what their lives might have been like. The image of the young mutilated Afghan girl brought forward a whole story in my imagination of why and how this happened which deepened my sense of anger and pity. Good locations to shoot from – making a reconnaissance. Kind of shots which might be expected or hoped for – such as distant, close-up, or detail. Variety of images to consider – the whole set will be more interesting with the most visual variety. Therefore consider vertical as well as horizontal; taken at different scales and focal length; variety of colour and lighting. It’s comforting to have a beginning ‘how to’ list when starting from almost zero. A few months ago I started off on a personal project concerned with reconnecting with my childhood. This involved me in spending a few days in September back in Sheffield and the Peak District, and I certainly made a list and kept a log book. What happened though was that as soon as I got back I realised that there were certain photographs it would have been good to have and arrangements I should have made beforehand. I’m still working on this particular project and gathering material together and, fortunately, I’m going back in April. The project for Assignment 5 will be a smaller scale. I have some initial ideas and, this time, will make sure I plan more comprehensively and stay nearer to home. In thinking about ‘telling a story’ there was also another helpful article by Michael Freeman on the Photonet website – ‘Three Tips to help your photos tell a story”. Tip 1 was that pictures also have to do a job of explaining so put yourself into your viewer’s shoes and ask yourself is anything is unexplained. Do your friends understand it, is anything missed out/needs explaining. This also brings words/captions into play – an area which has involved considerable discussion on the OCA Flickr site. Tip 2 is start with the basic 3-plus-1 ingredients. Start strong, develop the storyline, end strong. Plus 1 is that key shot a strong powerful image which will ‘halt’ the viewer and key the story somewhere. Tip 3 ( as above) is that a linear story is the easiest. I bought ‘Context and Narrative’ (Maria Short) last September as well. I’ve dipped into it but now intend to absorb it more conscientiously. Here I go! The WordPress.com stats helper monkeys prepared a 2011 annual report for this blog and so I thought I’d share it. “The concert hall at the Syndey Opera House holds 2,700 people. This blog was viewed about 11,000 times in 2011. If it were a concert at Sydney Opera House, it would take about 4 sold-out performances for that many people to see it.”. I’d always wondered what it would be like to have a blog and here I am now a year onward. It was quite challenging at first to make sense of how WordPress works but I feel much more confident now, so much so that I intend to upgrade to Pro so that I can have a more individualised blog when I start the next Module (still have Part 5 to tackle though on Art of Photography before then). Thanks to everyone who has dropped by and also made comments. Happy New Year to everyone with the wish that 2012 sees you happy, enjoying life, successful and as healthy as possible.